Buy Nelson Honey 200+ Twin Pack (2 x 500 grams) in the UK from our online shop or directly from our independent Scottish store. This Manuka Honey contains low levels of MG. Our 200+ grading system means it contains more than 200mg per kg of Methylglyoxal (MG). Nelson Honey’s Manuka Honey 200+MG is sourced from pure, clean and unpopulated natural environments in remote parts of the top of the South Island of New Zealand – free of pollution, chemicals and other contaminants. This special quality of Manuka honey is very rare and we are proud to share it with the rest of the world! Manuka honey is a monofloral honey collected by our honeybees from the Manuka flower. The honeybees collect and transform the nectar of the Manuka plant into honey by combining various digestive enzymes through a unique process. This naturally sweet Manuka Honey is rich in natural antioxidants and antibacterial properties. We, at the Stirling Health Food Store would NEVER knowingly sell manuka which has been blended or is unpure. As official stockist, we sell genuine Manuka Honeys directly from our shop in Scotland and online throughout the UK. View more products from Nelson Honey. Where can you buy real Manuka 200+ 2 x 500g safely online? If you are wondering where you can buy Nelson Honey 200+ Twin Pack (2 x 500 grams) safely online in the UK, then shop with us. We are an actual health foods shop; with real people selling real foods and products. Our award-winning independent shop is located in Stirling, Scotland since 1976. You can buy our Manuka Honeys in store or safely place an order with us online or over the phone. 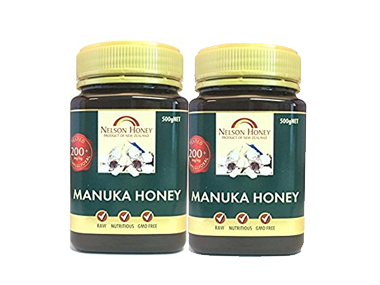 Manuka 200+ 2 x 500g - Nelson Honey 200+ Twin Pack (2 x 500 grams) in Manuka Honeys and Honeys, Jams & Spreads.